Graphene oxide is water-soluble, amphiphilic, non-toxic, biodegradable and can be easily dispersed into stable colloids. Ultrasonication is an very efficient, rapid and cost-effective method to synthesize, disperse and functionalize graphene oxide on industrial scale. In downstream processing, ultrasonic dispersers produce high-performance graphene oxide-polymer composites. In order to control the size of graphene oxide (GO) nanosheets, the exfoliation method plays a key factor. Due to its precisely controllable process parameters, ultrasonic exfoliation is the most widely used delamination technique for the production of high quality graphene and graphene oxide. Graphite oxide powder is mixed in aqueous KOH with the pH value 10. For the exfoliation and subsequent dispersion, the probe-type ultrasonicator UP200St (200W) is used. 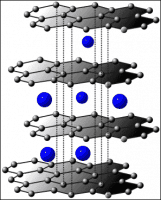 Afterwards, K+ ions are attached onto the graphene basal plane to induce an ageing process. The aging is achieved under rotary evaporation (2 h). In order to remove excessive K+ ions, the powder is washed and centrifuged various times. The obtained mixture is centrifuged and freeze-dried, so that a dispersible graphene oxide powder precipitates. Sonication is successfully used to incorporate graphene oxide (GO) into polymers and composites. 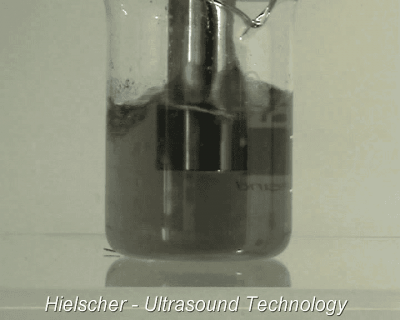 Hielscher Ultrasonics offers high-power ultrasonic systems for the exfoliation, dispersion and downstream processing of graphene and graphene oxide. Reliable ultrasonic processors and sophisticated reactors deliver the required power, process conditions as wel as precise control, so that the ultrasonic process results can be tuned exactly to the desired process goals. One of the most important process parameters is the ultrasonic amplitude, which is the vibrational expansion and contraction at the ultrasonic probe. Hielscher’s industrial ultrasonic systems are built to deliver very high amplitudes. Amplitudes of up to 200µm can be easily continuously run in 24/7 operation. For even higher amplitudes, Hielscher offers customized ultrasonic probes. All our ultrasonic processors can be exactly adjusted to the required process conditions and easily monitored via the built-in software. This ensures highest reliability, consistent quality and reproducible results. The robustness of Hielscher’s ultrasonic equipment allows for 24/7 operation at heavy duty and in demanding environments. This makes sonication the preferred production technology for the large-scale preparation of graphene, graphene oxide and graphitic materials. Offering a wide product range of ultrasonicators and accessories (such as sonotrodes and reactors with various sizes and geometries), the most suitable reaction conditions and factors (e.g. reagents, ultrasonic energy input per volume, pressure, temperature, flow rate etc.) can be chosen in order to obtain the highest quality. 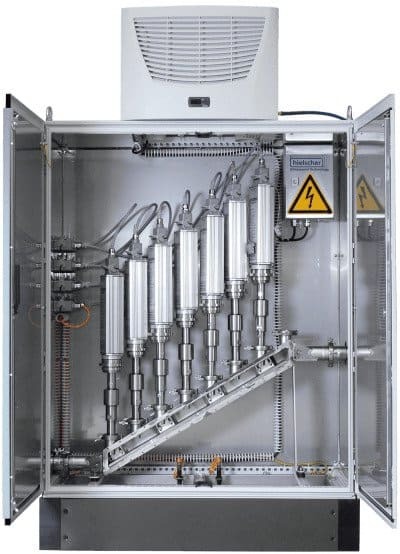 Since our ultrasonic reactors can be pressurized up to several hundred barg, the sonication of highly viscous pastes with to 250,000 centipoise is no problem for Hielschers ultrasonic systems. Due to these factors, ultrasonic delamination / exfoliation and dispersing excels the conventional mixing and milling techniques. Gouvea R.A., Konrath Jr L.G., Cava S., Carreno N.L.V., Goncalves M.R.F. (2011): Synthesis of nanometric graphene oxide and its effects when added in MgAl2O4 ceramic. 10th SPBMat Brazil. Kamisan A.I., Zainuddin L.W., Kamisan A.S., Kudin T.I.T., Hassan O.H., Abdul Halim N., Yahya M.Z.A. (2016): Ultrasonic Assisted Synthesis of Reduced Graphene Oxide in Glucose Solution. Key Engineering Materials Vol. 708, 2016. 25-29. Štengl V., Henych J., Slušná M., Ecorchard P. (2014): Ultrasound exfoliation of inorganic analogues of graphene. Nanoscale Research Letters 9(1), 2014. Štengl, V. (2012): Preparation of Graphene by Using an Intense Cavitation Field in a Pressurized Ultrasonic Reactor. Chemistry – A European Journal 18(44), 2012. 14047-14054. 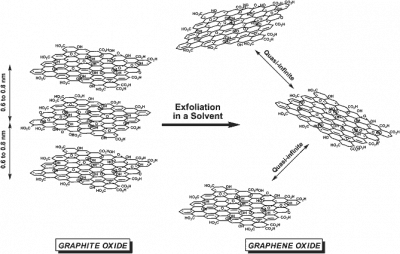 Tolasz J., Štengl V., Ecorchard P. (2014): The Preparation of Composite Material of Graphene Oxide–Polystyrene. 3rd International Conference on Environment, Chemistry and Biology IPCBEE vol.78, 2014. Potts J. R., Dreyer D. R., Bielawski Ch. W., Ruoff R.S (2011): Graphene-based polymer nanocomposites. Polymer Vol. 52, Issue 1, 2011. 5–25. Ultrasonic exfoliation of graphite oxide (GrO) is based on the high shear force induced by acoustic cavitation. Acoustic cavitation arises due to the alternating high pressure / low pressure cycles, which are generated by the coupling of powerful ultrasound waves in a liquid. During the low pressure cycles occure very small voids or vacuum bubbles, which grow over the alternating low pressure cycles. When the vacuum bubbles achieve a size where they cannot absorb more energy, they collapse violently during a high pressure cycle. The bubble implosion results in cavitational shear forces and stress waves, extreme temperature of up to 6000K, extreme cooling rates above 1010K/s, very high pressures of up to 2000atm, extreme pressure differentials as well as liquid jets with up 1000km/h (∼280m/s). Those intense forces affect the graphite stacks, which are delaminated into single- or few-layer graphene oxide and pristine graphene nanosheets. Graphene oxide (GO) is synthesized by exfoliating graphite oxide (GrO). While graphite oxide is a 3D material consisting in millions of layers of graphene layers with intercalated oxygens, graphene oxide is a mono- or few-layer graphene that is oxygenated on both sides. Graphene oxide and graphene differ from each other in the following characteristics: graphene oxide is polar, whilst graphene is nonpolar. Graphene oxide is hydrophilic, whilst graphene is hydrophobic. Reduced graphene oxide (rGO) is produced by ultrasonic, chemical or thermal reduction of graphene oxide. During the reduction step, most oxygen functionalities of graphene oxide are removed so that the resulting reduced graphene oxide (rGO) has very similar characteristics to pristine graphene. However, reduced graphene oxide (rGO) is not defect-free and pristine as pure graphene.